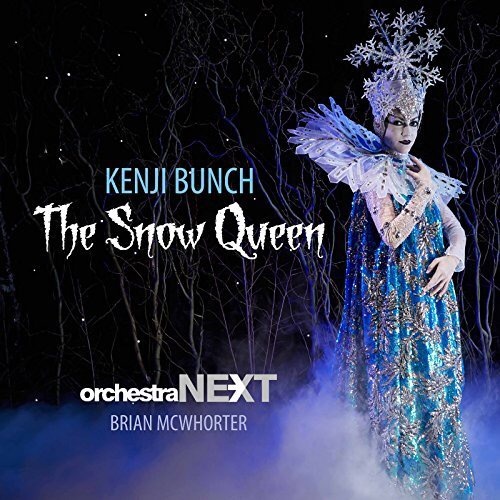 Kenji Bunch (1973- ) is a musician whose name has made it to my personal orbit many times but this is my first encounter with his music and what an encounter it is! This two disc set comprises a full length ballet commissioned and performed by the Eugene (Oregon) Ballet. There are at least two symphonies, numerous soloists and orchestra pieces as well as solo instrumental music. Though I’ve heard just snippets of his music aside from the disc under review here I think I can safely say that his style can be described as essentially tonal, even perhaps somewhat conservative, but the accessible qualities of his music do not translate into mediocrity. Quite the contrary, he is a very exciting composer and his style seems very well suited to an undertaking such as this ballet. Bunch appears to be a master of orchestral color and he uses it to great effect here. The two discs comprise 23 tracks much like one would expect of most classical ballets. The individual movements are 3-10 minutes approximately and they correspond to specific scenes that tell the classic story of the classic Hans Christian Andersen story. No doubt cost is the barrier which precluded a DVD release which looks like it was a gorgeous production. It is at least this writer’s impression that much of classical ballet music does not do well without the visuals of the dance. I am referring to 19th century models such as Coppelia whose music might be best performed in excerpted suites if dancers are not a part of the performance. Bunch’s ballet is more in the spirit of perhaps Prokofiev or Stravinsky wherein the music stands quite well on its own and even does a great job of evoking the images of the given scenes. Basically the music stands on its own as a narrative. Orchestra NEXT is a training orchestra and resident ensemble with the Eugene Ballet Company. They handle this complex and musically challenging score with seeming ease under music director Brian McWhorter. There is little doubt that those who were fortunate enough to see this fully staged production will appreciate the opportunity to relive their memories by hearing again the recorded score. But this will likely appeal to most fans of new music as well. It is a major work by a composer who deserves serious attention. This writer will certainly be listening. One of the hurdles on the way to long-term historical recognition is finding the next generation of interpreters for whom the music itself is not new but whose interpretation is needed anew in light of the music’s place in the canon of performed and recorded music. So Mr. Reich has now arrived in two fantastic new recordings. 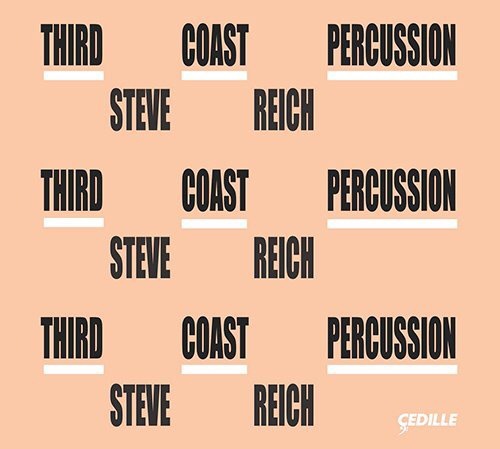 The first CD here is the Cedille (Cedille 90000 161) label debut by Third Coast Percussion, a young Chicago based group. 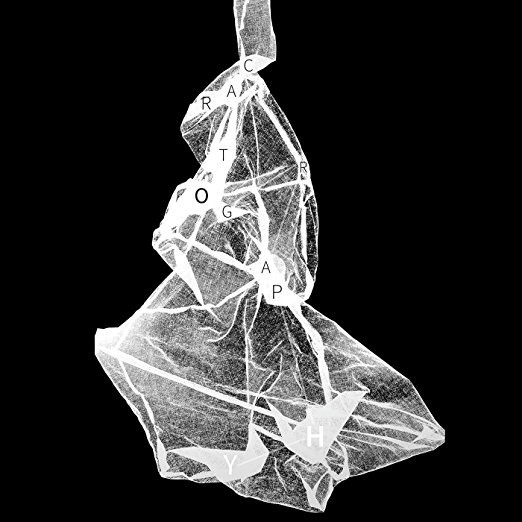 The label itself is reason enough to pay attention with their intelligently selected and well-recorded releases. But even so this one stands out for a couple of reasons. As Reich reaches his 80th birthday (as are many composers whose work informed my listening life since the 70s) we are seeing the next generation (or so) of performers, musicians for whom this music is not new. (Third Coast Percussion is Sean Connors, Robert Dillon, Peter Martin and David Skidmore. They were founded in Chicago in 2005.). As these dedicated musicians traverse this repertoire they see it from a different perspective and they acknowledge this in the accompanying notes by Robert Dillon. No doubt they are familiar with the music and have heard some if not all previous recordings. This music is no longer new and novel the way it was to those who first heard it. And that is what we have here, a new take on music already familiar giving us the perspective of another generation. The second reason to get this recording is the sheer beauty of the sound. It is a masterpiece of recorded sound which does justice to the work of these fine musicians as well as the music. The album was recorded at the University of Notre Dame’s DeBartolo Performing Arts Center (where Third Coast is in residency). Dan Nichols was the engineer assisted by Matt Ponio. It was mastered by Jessie Lewis and Kyle Pyke. The CD opens with the recent Mallett Quartet (2009) which has been recorded only once before. The piece is in three sections fast-slow-fast split over the first three tracks. It is one of Reich’s finest compositions showing him as a still vital artist and it will no doubt receive many more performances but it would be hard to imagine a better recording. The second selection is, for this writer, one of Reich’s more unusual pieces. The Sextet (1984) is scored for two keyboards (pianos doubling synthesizers used for long held tones) and percussion. David Friend and Oliver Hagen lend their formidable keyboard skills to this work and help it to swing. I must admit that this performance has resulted in me giving this work some serious close listening again and I am liking it better. Some of these movements seem like precursors to some of the writing in Reich’s wonderful The Four Sections (1987), another work that deserves more attention. The brief but lovely Nagoya Marimbas (1994) is pretty much an accepted staple of the classical marimba repertoire and has also been transcribed and performed on guitars as well. As with the preceding the performance is faithful and lively. For the final track a decision was made to go back to early in Reich’s output with Music for Pieces of Wood (1973). As with much of his early work we see his experimental side focusing as much as possible on a single process. It uses the same rhythmic pattern as the 1972 Clapping Music but uses additive rather than phasing techniques (I believe), a great example of the roots of minimalism. The group does some toying with the choice of percussion but, as in the preceding tracks, manage to create a performance worthy of the best interpreters in their generation. Happy Birthday Mr. Reich!! This second CD (New Focus fcr 165) is another aspect of crafting a legitimate new interpretation of a given piece of music. 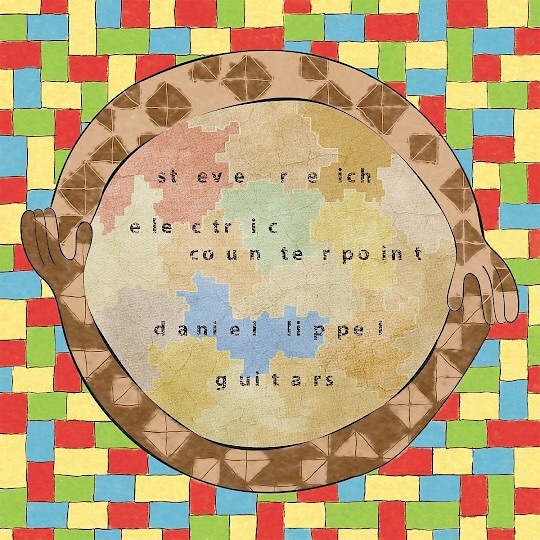 Guitarist Daniel Lippel goes back to some of the roots of Reich’s mature style, Ghanaian drumming. Reich seems to have achieved his personal artistic synthesis after his encounter and study with the master drummers of Ghana. It is here that he was finally able to synthesize the gifts received from his study of jazz (Reich was/is a jazz drummer) and his tape music experiments into the larger forms for which he is now known through these studies with West African musicians. And it is here that Lippel goes, with an assist from musicologist Martin Scherzinger, to create his (re)vision of this classic Reich composition. Electric Counterpoint (1987) was written for and first recorded by the still wonderful jazz guitarist Pat Metheny. His recording is certainly definitive but, as with all music performance, hardly the last word. Several artists have presented their versions (David Tanenbaum’s acoustic guitar version deserves more attention by the way). It is a very appealing and interesting piece cast in a classic fast-slow-fast format that presents formidable challenges for the musician but not for the listener. It is difficult (and certainly beyond the scope of this review) to say specifically what Mr. Lippel has done differently but there is clearly a difference (further notes can be found here). I am loathe to find adjectives to describe this recording except to say that it is well worth your time to hear it. It provides a different way of hearing much as Glenn Gould has done for Bach. Just sit back and enjoy. My fears were clearly unfounded as I listened to each track. Patience turned to excitement and I think I’ve now heard a sort of new breed of instrumental specialist. Lee plays oboe as well as the closely related English Horn and the very little known Oboe d’amore with expertise. But she is not a specialist in the “period ensemble” genre per se. Rather her focus is on the potentialities of her instruments as vehicles for new music, improvisation and solo performances. There seems to be little threat of a forthcoming rendition of the Telemann Flute Fantasies played on one or all of those. Instead we have a gifted musician who seems poised to shepherd these instruments into new adventures in the 21st century. The album consists of 5 tracks, all less than nine minutes in duration but each is a fully realized composition lovingly interpreted by this performer. I am only familiar with one of the composers here, Emily Doolittle whose Social Sounds from Whales at Night (2007) is the only track which features any accompaniment. It is a good example of Doolittle’s potentially groundbreaking work with animal sounds. The other tracks manage to rise above the level of mere effects-ridden etudes to the level of compositions that define their own sound world and subjugate that world to artistic expression. Very interesting listening. From the first track it is clear that this is a musician with a deep understanding of the expressive possibilities of her instruments in both traditional and extended techniques as well as a clear sense of how to find music of substance. Her playing sounds effortless suggesting that she puts a great deal of time into honing her virtuosity but she clearly moves beyond the technical to master the expressive range. I would certainly be willing to hear just about anything Ms. Lee chooses to play including the relatively obscure repertoire for the oboe d’amore but I have my fingers crossed that we may get to hear her tackling concertos by Morton Feldman, Vincent Persichetti, Witold Lutoslawski and Hans Werner Henze, big projects that are nice to hope for but we do see that her ear for the smaller projects is clearly golden.